Are you looking for Resource person jobs? Good news for you! The Central Institute of Indian Languages (CIIL) has announced the notification for recruitment process 2019. The Central Institute of Indian Languages (CIIL) is an Indian research and teaching institute located in Mysore, Karnataka. 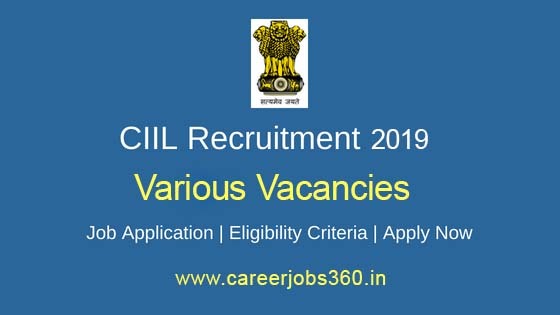 At present, CIIL is conducting the recruitment process 2019 to fill the vacancies under different categories with skilled candidates. Totally, there are 46 vacancies in three posts; Chief Resource Person, Senior Resource Person, and Junior Resource Person. The interested and eligible candidates can apply for the post to start your career in the central government sector. Visit the official website www.ciil.org to download an application form. Senior Resource Person Should have M.Phil /Ph.D. in Linguistics from an authorized University to apply for CIIL Senior Resource Person Recruitment 2019. Chief Resource Person Should have M.A. or MSC/B.Tech/M.Tech in Linguistics/Computational, Linguistics/NLP/Applied Linguistics from an authorized University to apply for CIIL Chief Resource Person Recruitment 2019. Senior Resource Person M.A. in Linguistics/Indian Language or allied disciplines like Translation Studies, Cultural Studies, Women’s Studies from an authorized University. Junior Resource Person (Technical ) I M.C.A/M.Tech in Computer Science with specialization in Android and iOS Mobile app development from an authorized university. Junior Resource Person (Technical ) I M.Sc/ B.E in Computer Science from an authorized University. Junior Resource Person (Technical) II Should have Degree/Diploma in Multimedia, Web Designing from an authorized university to apply for CIIL Junior Resource Person Recruitment 2019. Junior Resource Person ( Technical) II Bachelor’s degree in any stream from an authorized University. The maximum age limit of candidates who are applying for CIIL Mysore Recruitment 2019 is 58 years. Step 7: Verify and send the application form by hand/ registered/speed post. Postal Address: The Assistant Director (Admn.) i/c, Central Institute of Indian Languages, Manasgangothri, Mysore-570006, Karnataka. The candidates who are applied to the CIIL Recruitment 2019 will be selected on the basis of Test or Interview.